Daily avalanche advisories are planned to resume in mid November or later as conditions dictate. Occasional intermittent early season updates to this page may occur earlier if conditions warrant and resources are available. The first storm cycle of the season is lined up for this week. New snowfall amounts of 1 to 3 feet are possible over the upper elevations. Expect accumulating snowfall Sunday night through Thursday. Mellow touring over snow covered forest roads will certainly be an option this week. More recreation opportunities might exist if upper end forecast snowfall amounts are reached. With little (if any) exception, new snow this week will deposit onto bare ground. This will keep snowpack instability and avalanche concerns limited to within the storm snow and to wind slabs that form on wind loaded slopes. Areas directly below ridgelines as well as gully features that are subject to wind loading may exhibit slab formation despite a shallow snowpack. Wind loading can increase snow deposition rates by 2 to 10 times the rate that snow is falling from the sky. This rapid loading can create enough snowpack instability for an avalanche to occur, despite only a few inches of snow on the ground in wind protected areas. Make constant observations as you travel, looking for indications of current or recent snowpack instability. The best indicator is recent avalanche activity. Other signs of snowpack instability including wind loading, collapse, audible whumpfing sounds, shooting cracks, and/or test slope failure are excellent indications that the snowpack in the immediate area is unstable. All that is needed is a slope steeper than 30 degrees and a trigger. If headed out to travel on or near avalanche terrain, each person should travel with avalanche rescue equipment including a transceiver, probe, and shovel with which they are well practiced. Allow only one person at a time to travel on slopes that are steeper than 30 degrees. Many hazards such as rocks, down trees, and stumps are often hidden just beneath the snow surface. Travel cautiously and slowly as it is a very long winter after getting hurt this time of year. Often the best way to satiate early season excitement is to put fresh batteries in avalanche transceivers and practice rescue skills while out touring on snow covered forest roads. Check out the avalanche tutorials specifically designed for skiers and snowmobilers at the Forest Service National Avalanche Center web site. 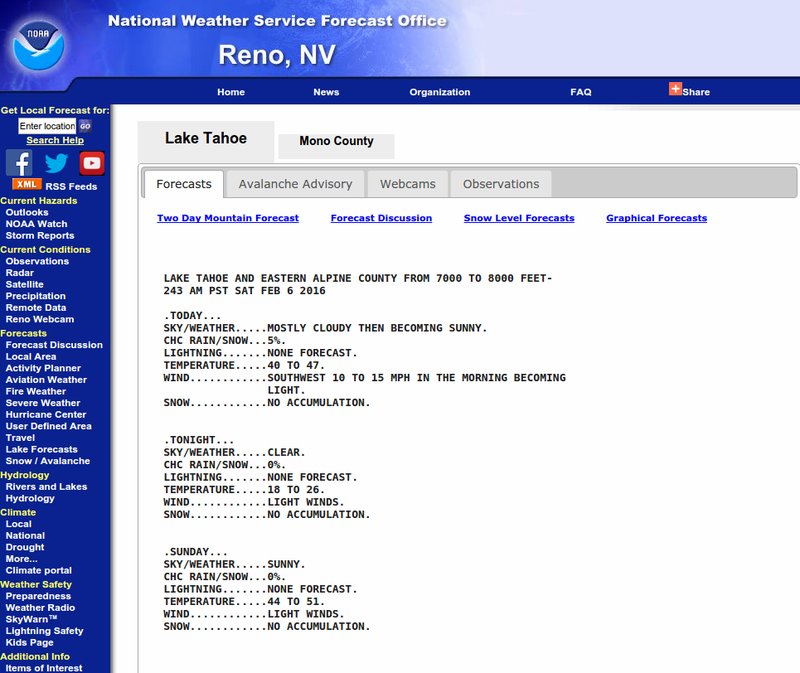 Current remote weather station data from the NWS can be found by clicking here. A general weather forecast for the area can be found by clicking here. Please note: If you are intending to travel within the boundaries of a ski area that is not yet open for the season, no avalanche mitigation measures exist at this time. Please treat any closed ski area as the backcountry terrain and snowpack that it currently is. Respect any closure signs that may be in place at the parking lot or base area. Carry proper backcountry equipment and avalanche rescue equipment. Expose only one person at a time to avalanche terrain (which is often widespread and complex within a ski area). Do not traverse above others. Things may look the same and seem very familiar to an operating ski area, but from a safety standpoint, right now the risk is significantly higher.